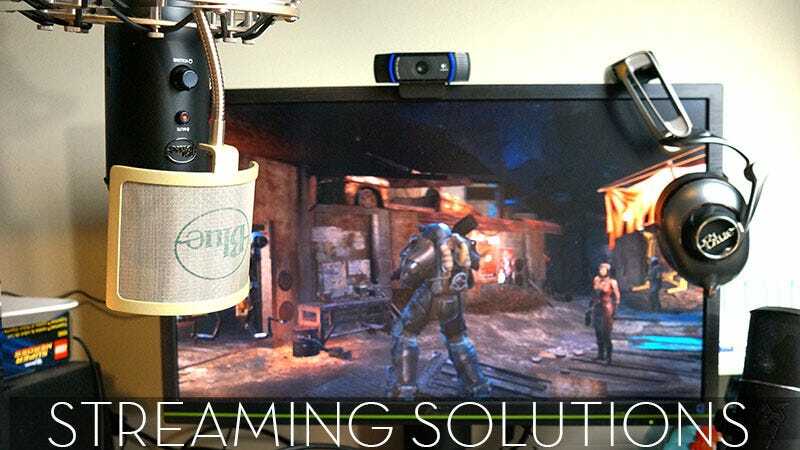 With so many people either streaming live video game play to the web or consuming it, trying to determine the best equipment for your broadcasting needs can be daunting and confusing. What we need are examples. Because if there’s one thing the internet has told me, if a handful of websites and Google searches doesn’t work, just ask a couple of thousand people. It doesn’t clarify much, but at least we’ll get some great suggestions. So what does your streaming setup look like? Is it you in your pajamas with a laptop webcam’s built-in mic, or is your entire gaming room outfitted with colorful acoustic foam? Let’s share streaming content serving suggestions. I’ll go first—here’s what I’ve been using. The most important part of any streaming setup, other than a stable network connection, is the device that takes the noises they make and shares them with the world. A streamer can get by without a video camera, but a stream without commentary of some sort is pointless, boring and borderline evil. I’ve been a big fan of the Blue Yeti USB mic for ages. It looks professional (until you mount it haphazardly on an army with a shock mount that’s seen better days and sounds great. Coupled with Yeti’s Pop! pop filter my voice comes across warm and rich without picking up too much background noise. I’ve got two of these in my arsenal, a silver unit I purchase several years back (still works like a charm) and the newer Blackout model. I’m considering upgrading to the Yeti Pro, but mainly for connect through a sound board and recording video voiceover—a lot of the recording software I use isn’t very nice to my input, and I’d like some greater control. It also bears noting that while the Yeti USB is great for voice over, our own Patrick Klepek suggestions another Blue product—the trusty Snowball—for dedicated streaming. He says the $60-$70 sphere picks up a lot less background noise than its more powerful cousin. I might grab one of those because I am addicted to microphones. The Razer Seiren, a relatively new entry into the USB headphone market, is a bit pricier than the Yeti at $179, but it records at the same 24bit/192kHz as the $250 Yeti Pro. The only reason I’m using it as a backup right now and not as my primary is because the black matching Razer shock mount for the Seiren is still on backorder. Here’s how I wound up purchasing a (well, technically two) Logitech C920 HD Webcam: I went to Google and typed in “Best webcam for streaming.” Then I hit the enter key. Crisp, clear, and with a nice wide field of view, this is a webcam you can put right up to your face and still get all of your giant noggin on the screen. Or pull back, and show everyone how messy your office is. Of course the most important aspect of being on camera for streaming is having a personality. People will forgive slightly inferior image quality if you’re amazing. That’s why I bought the best camera I could. Well, that’s a very marketing picture of it. One moment. This is a well-loved set of headphones. Not the torn cup—I set them down on a freshly-opened FEDEX package and the glue got them, but they are still beautiful to me. The Mo-Fi is probably the best set of headphones I’ve ever had on my head. Stylish (the band design is inspired by race cars or something), comfortable as well, and incredibly powerful. Plug them into your PC or phone or game controller and they sound amazing. Charge them up and power on the built-in audiophile amplifier and they will kill you with amazing. These are seriously gorgeous cups. I used to take them off when I recorded video. Now I just leave them on all the time. They make me look $349 better than I normally do. Of course no one needs $349 headphones to stream. It’s not like your listeners are going to appreciate it. But when you’re listening to a game and monitoring your voice at the same time, it might as well sound as best as it can. The name really says it all, doesn’t it? Free, open source, versatile—Open Broadcaster Software is an excellent way to get your gaming onto the internet. I’ve tried some pay services in the past, and none of them have compared, and the software that comes bundled with my various video capture devices...well, they tried. Odds are if someone from Kotaku isn’t streaming directly from a consoles, they’ve got OBS running. I’ve picked up a green screen but I’m afraid to use it. I’ve actually streamed with one before—a massive green sheet—but I wasn’t lighting it evenly and the shadows became fuzzy bits. Lighting is so important to any video project. To that end I picked up some Cowboy Studio softboxes from the internet, which are amazing for lighting videos but pretty bad at most other things, like being able to move an inch without falling over. I’ve also tried LED lights with mixed results—even lighting, weird colors. Let;s see, I’ve got my mic on a Rode boom arm. My hair and makeup is done by me not giving a damn, and my streaming platform of choice is Twitch (I’m just waiting for Justin TV’s big comeback). I’ve shared mine, now share yours. Share the secrets of your streaming success with the world, so that one day we’ll all be too busy streaming live games over the internet to watch other people streaming live games over the internet. To contact the author of this post, scream into his mic while his headset is on, write to fahey@kotaku.comor find him on Twitter@bunnyspatial.